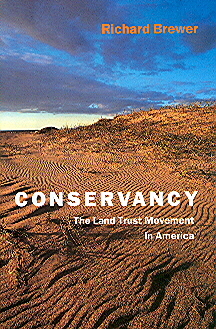 An electronic-book version of Conservancy: The Land Trust Movement in America by Richard Brewer has recently been made available by the University Press of New England. It is available at various e-book retailers accessible on the web including Amazon.com (Kindle) and Barnes & Noble (Nook). 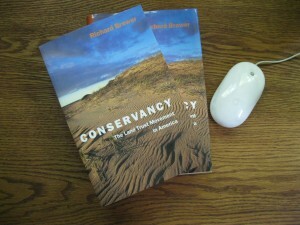 The paperback version of Conservancy is still in print and available at most web-based book stores and some brick-and-mortar ones. After a cold March–very different from last year–there are a few signs of spring. Today, at the Oshtemo Township oak area I heard a few wood frogs call mid-afternoon. The day had gotten steadily warmer and it must have been in the high 50s by then. Air temperature. I didn’t have a thermometer so I’m not sure what the water temperature was. Looking back, I see that wood frogs first called here last year on 12 March. Not only that, I led a spring wild flower field trip to Harris Sanctuary on 7 April 2012. That corresponds to this coming weekend. I haven’t been to Harris yet this spring, but at the beech-maple forest in Pavilion Township, about the only things up are spring beauty, wild leek, false mermaid weed, and harbinger of spring. The last is the only thing that was in bloom as of Monday (1 April). It came up a few days earlier, with flowers that looked like white pin-heads. Here in the oak woods probably no native herbs are yet in bloom, but winter aconite, snow drops, and crocus are, and honey-bees were visiting the crocus in late afternoon with the air temperature at 59 degrees. Few native herbs are visible above ground, but the rosettes of rather heart-shaped leaves of golden ragwort were green and healthy a little upslope from the same pond where the wood frogs had been calling. Save the Earth. Pitch In. Help Out. A very little goes a long way. If you’re interested call. Don’t stop trying. This advice appears in the Stephanie Mills book In Praise of Nature (p.165). Mills mentions that sometime around 1990 four little girls who had learned that the Earth was endangered were visiting homes in her neighborhood to spread the alarm by handing out colored posters they had made. The one they gave her showed “our blue and green planet rising in a field of eight yellow stars” and included the quoted text. Stephanie Mills attended college in California, where she made an environmental name for herself at a young age with the commencement address she gave in the spring of 1969 at her graduation. Under the influence of Paul Ehrlich’s writings on human population, she told the other graduates and their parents that we were breeding ourselves out of existence and announced that “the most humane thing” for her to do was “to have no children at all.” It made a media splash and Mills joined in the very active environmental movement around San Francisco. Along with many talks here and there around the country, she was involved with writing and editing such publications as Earth Times and the Whole Earth Catalog. In the mid-1980s Mills became a Michigander, moving to the Traverse City area near the tip of the Lower Peninsula. A few years later, she began work on In Praise of Nature. The book has a somewhat cumbersome format but manages to include brief reviews of and short selections from a good many books important in the 20th-century development of environmental thought. Included are pieces by serious students and thinkers such as Aldo Leopold, George Perkins Marsh, Rachel Carson, and John Muir plus other more journalistic contributions that summarized the current state of various environmental topics. 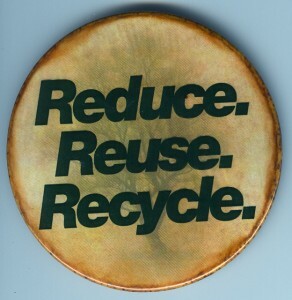 There is a plenty of good environmental prose to be found in the book, but as practical environmental advice, not much of it is as strong or useful as the admonitions of the four young Michigan girls. Save the Earth! Pitch In. Help Out. A very little goes a long way! If you’re interested, call. Don’t stop trying! The woods and meadows that so attracted [new residents] disappeared as soon as developers got around to building on them, and if the residents wanted to find what other nature features would be next to go, they had only to check the names of the subdivisions being planned. When a developer puts a woods into the name, or a vale, heights, forest, creek, or stream, he is not conserving; he is memorializing. Subdivisions are named for that which they are about to destroy. William Hollingsworth Whyte, called “Holly,” wrote those words in his 1968 book, The Last Landscape (Doubleday & Company). Whyte was many things–a keen and scientific student of human behavior, a planner and land conservationist, and an excellent writer. He was the primary architect of the conservation easement, currently the most widely used method of private land conservation. Whyte may not have been the first person to notice that developments tend to be named after the natural features they damage or obliterate, but I’m pretty sure he was the first prominent conservationist to state it as a rule. Most of us can come up with local examples. If we saw an ad for lots in a new development called the Preserve at Eagle Knoll, we would win more often than we lost if we bet that the knoll had been flattened, the eagles were gone, and nothing was preserved. Recently, I came across a related but slightly different approach to naming developments right here in Kalamazoo. A good many years ago, Western Michigan University bought some property a little beyond the west edge of the campus. The property, sometimes held in the name of the WMU Foundation, adjoined a city well-field and the Arcadia plat and lay between Solon Street on the east and Drake Road on the west. WMU had bought the land thinking they were going to need a bigger, grander football stadium, but the need didn’t materialize, and it turned out that the cost of such a project, especially the required utilities, was prohibitive. The land, which for convenience can be referred to as the Arboretum, was mostly recovering agricultural fields but with a few relict patches of native vegetation. On the northwest side of the property grew a few bur oaks of various sizes. This was near the south edge of one of the eight tall-grass, black soil prairies of the county–Grand Prairie–and these trees were a heritage of the fringing bur oak plain. Also on the north boundary but farther east was a small pocket, a little valley, of mesic forest, but an unusual type of mesic forest with few or no beeches or sugar maples, dominated instead by basswood trees. Part of this little valley was on the WMU property, the rest on the parcel adjacent to the north. For a good many years the land abided, the plants and animals cycling through the seasons, visited by no one except walkers and joggers, bird-watchers and berry-pickers, and an occasional ecology class. Several years ago, things began to change. Someone interested in the sequence and timing could probably work out the details from the Kalamazoo Gazette mlive archives if they wanted to spend the time. Here’s a place to start. A quick synopsis is that WMU wanted to monetize their land holdings, and the city of Kalamazoo desperately wanted an east-west street in the region. Other business and governmental entities were or became involved. The Kalamazoo School system built a new middle school. The city built a road, which they called a parkway, crossing the property from Drake Road to Solon Street. I’ve never known just what a parkway is, but a prominent feature of this one is that there is no place to park along it. One result is that access to the arboretum for walkers is pretty much limited to some of the immediate neighbors. 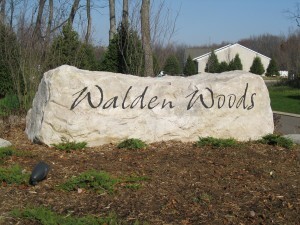 The name of the new development: Walden Woods. Each town should have a park, or rather a primitive forest, of five hundred or a thousand acres, where a stick should never be cut for fuel, a common possession forever, for instruction and recreation…. All Walden Wood might have been preserved for our park forever, with Walden [pond] in its midst…. In Kalamazoo’s case, the 180+ acres of the Arboretum could have been turned into a city park–badly needed in this area of the city–along with an adjoining nature preserve. Something of this sort is what most of the neighbors and many other Kalamazoo residents wanted. But, that, of course, is exactly what did not happen. Instead, we have what we have, which includes Walden Wood in the form of a condo development. It’s hard not to see this as another sad example of Whyte’s rule. But perhaps we should try to take a little cheer from the situation. For example, if other developments follow in the arboretum, the names of dozens of other conservationists and conserved natural areas are waiting to serve. With Walden Woods honoring Thoreau, it would be only fair to have a Muir Woods for John Muir. One of these already exists, but California is a long way from here so probably there would be no confusion. Among Teddy Roosevelt’s many conservation achievements, he set aside the first-ever bird sanctuary, Pelican Island. How about Pelican Arboretum as a general name for the whole site? In my last post I talked about how bland and uneventful the mesic forest is in late summer and early fall. I was giving my impression from a good many years of experience with such forests. But I spent a few hours on three days recently, actually looking at what was happening. Partly I was hoping to see Triphora trianthophora and partly I wanted to check my memory. I didn’t find three birds orchid, and not a lot was happening. Not a lot, but still more than I had remembered. For one thing, I had forgotten how important the shedding of fruit is at this time of year. On 13 August, wild black cherry fruits were numerous on the ground, and there were more of them on visits in early and mid September. I have a feeling that birds that want black cherries eat the ripe–or green–fruit on the tree, but perhaps some mammals wanting the dried flesh or the stone wait for the cherries to drop. That 60-year-old (but still unsurpassed) manual, American Wildlife and Plants, by Alexander C. Martin and two co-authors, suggests that cherries are eaten by red foxes and gray squirrels, but doesn’t comment on when they gather them. 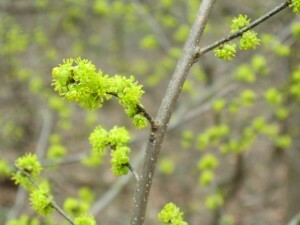 By 20 September, there were lots of samaras, the small key-like fruits of sugar maple on the ground. 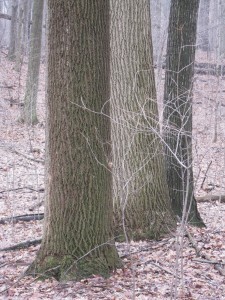 Sugar maples are always the most common saplings in the mesic woods in Michigan. There may be a rare year when the seed crop is low, but I think seed supply is rarely a limiting stage in the maple’s life cycle. It’s not noticeable when you’re walking on the soft earth of the forest, but where the maple fruits have fallen on a hard surface, like a concrete walk, they snap when you step on them, like popping bubble-wrap. Great fun, almost like popping ripe touch-me-nots. On the 20th of September also, there were many light tan, prickly beechnuts on the ground, and more were coming down. Some had one or two fruits inside and some were empty, but I had no way of knowing whether the two, sometimes three, fruits had been plucked out on the ground or in the tree or whether all had aborted. 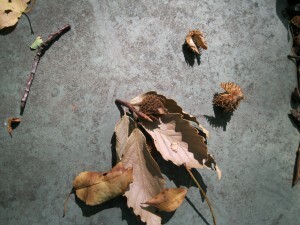 There’s no question about what animals eat beech fruits. The answer is everything. Well, not warblers, but wood ducks, grouse, grackles, jays, woodpeckers, bear, squirrels, fox, chipmunk, deer. I thought there were especially large crops this year from all these trees–cherry, maple, beech. Whether some of this could be related to the unusual warmth of the summer is impossible to say. Tree crops do fluctuate, with one very good year rarely being followed by another. There were other good things to be seen on my visits to the woods. Lots of herbaceous plants and shrubs were bearing ripe fruit–American poke, or pokeweed, had ripe fleshy fruits. Such things as Polygonum virginianum and Geum canadense had smallish, dry fruit. The fruits of red-berried elder were long gone, eaten by birds, but there on the stems, two at a node, were large flower buds ready for next spring. As I’ve claimed before, not much was in bloom, although Geum canadense had a few flowers with two or three white rounded petals still clinging. Aster lateriflorus. Photographed 20 September 2012 in Pavilion Township MI by Richard Brewer. But one species was definitely blooming and near its peak. It wasn’t three birds, which I didn’t find. 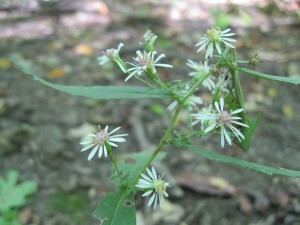 It was a little white aster, sometimes called calico aster. The scientific name situation in not very satisfactory, but for our purposes we can refer to it as Aster lateriflorus. It’s not showy, but it was blooming on August 13 and sill blooming on September 20, with no end to its season in sight. It appears that the more-or-less satisfactory resolution (as of about this time last year) to the proposed wide trail through the Ott Preserve has fallen through. The issue is again before the Calhoun County Board of Commissioners. Last year, the Board listened carefully to all sides and rejected the poorly conceived plan brought to it by the Calhoun County Trailways Alliance. In effect, the Board affirmed a compromise in which a route minimizing mileage and potential damage was to be sought. I would have wished as part of the action at that time that a definite route had been chosen and agreed on or, if not, that the principles to be used in selecting a route be settled–no penetration near biologically sensitive areas, minimal alteration of ground contours, etc. None of this was done, but I–and I think most people–were left believing that the route would pretty much follow the Consumers Energy right-of way, an already disturbed section along the west side of the Preserve. It now appears that choosing the route was left to the Trailways Alliance Board. Furthermore, negotiations seem to have been left to the Alliance, so that when the Alliance decided that the trail ought to cut across some private property, it was the Alliance negotiating easements with the owners. It does not seem surprising that the negotiations failed. Neither is it surprising that the Trailways Alliance is now back, wanting a long route through relatively undisturbed areas of Ott. Evidently some new alternative has been suggested. Possibly it has merits. But I doubt that it should be accepted in the next week or month. 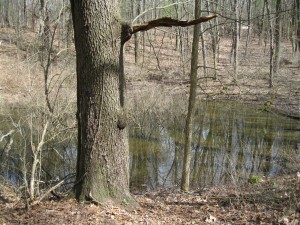 The Board’s stewardship of the Ott Preserve should include a real effort to let the public know exactly what is planned as to route, methods (construction, stewardship}, effects on vegetation and animals, hydrology, topography, and funding for all likely costs including ongoing remediation of damage produced by the trail traffic. Essential to a final decision is a thorough ecological survey of the Preserve. That such a survey should be done has been clear since such a trail project was proposed. Up-to-date information is needed on what features most need protection and where they are. Baseline data is needed, so that the damage such a trail will do can be unambiguously detected. Who would suppose that a large-scale project such as this could be started without such a survey? The survey should have been done a few years ago. It could have been done during the past year. Perhaps the Trail Alliance would prefer that no such survey ever be done. This renewed attempt to run a trail through Ott has come up quickly. It should not be acted on quickly. People need well-advertised opportunities to question proponents–and opponents. People need to be able to walk any proposed route and judge for themselves. They need to be able to answer for themselves–Is this the route we want? Do we want a 14-foot-wide swath cut through the Ott Preserve at all? The foregoing is a slightly modified version of a letter I emailed to all of the Calhoun County Commissioners having email addresses this morning. The Commission is scheduled to take up and perhaps vote on the new proposed route tomorrow night ( 3 May 2012) at their regular meeting. Information about the Preserve features, history including the 2011 attack and another still earlier incident are given here and in several other posts on my website around the same time. I’m leading a field trip to a beech-sugar maple forest this spring. We’ll look at the spring flowers and as we stroll around also talk about what mesophytic forests are like, why they are where they are, what the interactions among the organisms are, and other such natural history and ecology topics. The specific site where we’ll gather is the Mildred Harris Sanctuary north of Kalamazoo. It’s owned by the Michigan Audubon Society and has been stewarded for many years by the Audubon Society of Kalamazoo. The trip is sponsored by the Southwest Chapter of the Michigan Botanical Club as part of its 2012 project concentrating on natural features and conservation in Oshstemo Township (known to some as the Occupy Oshtemo movement. I’ve led a trip along these lines several springs in past years, to one or another of the remaining examples of mesophytic forest in southwest Michigan. But there’s a difference this year. Most such trips for spring ephemerals led by me or others have been held in mid or late April or even early May. This year the president, Tyler Bassett, of the Southwest Chapter of the Botanical Club and I had agreed on Saturday April 21 as the date. Then the second week of March arrived. The beginning of March had temperatures fairly close to the historical averages–30s as highs and 20s as lows. March 6 started a run in which day after day had highs at least in the 60s and often the 70s. March 19 to 22, had a run of highs in the 80s. The last freezing temperatures came far back in February. Looking at what was happening to the flora, Tyler and I decided to move the date of spring wild flower trip up by two weeks, to Saturday March 7. One swallow doesn’t make a summer, but seventeen days with temperatures between 60 and 85 in the middle of March may make it necessary for Michigan nature organizations to revise their field trip calendars. Here’s an idea, a sampling, of what’s been happening this spring: As mentioned in my last post, I heard wood frogs in Oshtemo Township 12 March and by the next night, they were joined by a few spring peepers. By the night of 15 March, both these species as well as chorus frogs were in full voice. On the 15th, the high temperature was 79 and the low 55, compared with historical averages of 45 and 27 degrees. As to the plants, on a visit 14 March to Newton Woods at Russ Forest, two friends and I found spring beauty up, a broad-leaved sedge with flowering stalks, and harbinger of spring close to full bloom. In Oshtemo Township, spice bush was in full bloom by 18 March, a golden haze over the edges of the kettles where the frogs had gathered. Bloodroot was in bloom 19 March. Spring beauty, Dutchman’s breeches, Yellow violet, harbinger of spring (nearly done), blue violet, Carex plantaginifolia (nearly done), toothwort, purple spring cress, wood anemone, and skunk cabbage. Several other species were up and some had obvious flower buds. So we’ll gather this year April 7 at the Harris Sanctuary which is in the southwest corner of F Avenue and 8th Street. It’s about 3 miles north of the trail-head of the Kal-Haven Trail (which is on 9th Street). F Avenue is a gravel road–a Natural Beauty road, in fact. Attendees should park on the north side of the road. Be there by 10 AM. Harris is on the Kalamazoo moraine, so there will some mild hill climbing. We’ll finish about noon. Bring a sandwich and have lunch sitting on a log if you wish. The technically minded may notice that the Harris Sanctuary is not in Oshtemo Township. But it’s pretty close. Three-quarters of a mile north. With temperatures in the 50s and 60s the last few days–and predicted as mid-70s today–spring is advancing fast. Wood frogs were calling in the larger pond Monday, March 12. By yesterday, they were in full chorus in both ponds and by last night, a few spring peepers had joined in. Among the bird arrivals I’ve noticed (since we’ve been back), Red-winged Blackbirds were numerous Monday morning, and I saw two American Robins along our road, where none had been all winter. Black-capped Chickadees were giving their spring, “fee-bee” song Tuesday morning. But there has been little in the way of wild flower action, at least in the oak woods. Honey bees were visiting the non-native winter aconite, which is in full bloom. Katy and I just returned from Panama. I’ll write more about the trip later. This note is a short Panama addendum to the Turkey Vulture post of a few weeks ago. In reading about Panama before we went down, I came across some of Frank M. Chapman’s observations on Turkey Vultures in his 1938 book Life in an Air Castle. The observations were made at Barro Colorado Island in the Canal Zone where Chapman, Curator of Birds at the American Museum, spent a good many dry seasons beginning in 1925. He was one of the ornithologists who performed some field experiments that established that Turkey Vultures could readily find carrion without reliance on vision. One of his trials was “The Empty-House Test.” In it, he and E. Thomas Gilliard placed the body of a coati on a shelf hidden from the outside in a vacant house. This was done the afternoon of 24 December 1935. No Turkey Vultures had been seen in the vicinity for at least a month. Within the next three hours, five more Turkey Vultures and one Black Vulture (presumably attracted by the sight of the Turkey Vultures descending) made appearances. A similar “Box on the Hill Test” plus many trials where carcasses securely wrapped in three layers of gunny sacking–burlap–were laid on the ground under forest cover gave similar results. The wrapped carcasses were monitored with flash cameras triggered by a wire attached to the bait. The resulting photos showed that the hidden carrion was quickly found, and always by Turkey Vultures. The unanimity of these trials pretty much eliminates the idea that the Turkey Vultures must see the dead animal to find their food. The trials do not by themselves show that the sense of smell is involved, and in fact, two naturalists within a couple of years of one another suggested that vultures might be finding dead animals by noticing carrion-feeding insects (or even small mammals) attracted to corpses. William B. Taber, Jr. was the first, writing in the Wilson Bulletin for 1928. He pointed out that Turkey Vultures can be attracted to carrion by seeing a cluster of crows on the ground (around a dead animal) and suggested that they might very well be similarly attracted to a bunch of brightly colored carrion beetles. Maybe even hearing. Perhaps it’s time for someone to do a well-designed test of whether the buzzing of blowflies or the clicking or squeaking sounds made by a gathering of carrion-eating beetles would pull vultures down from the sky.